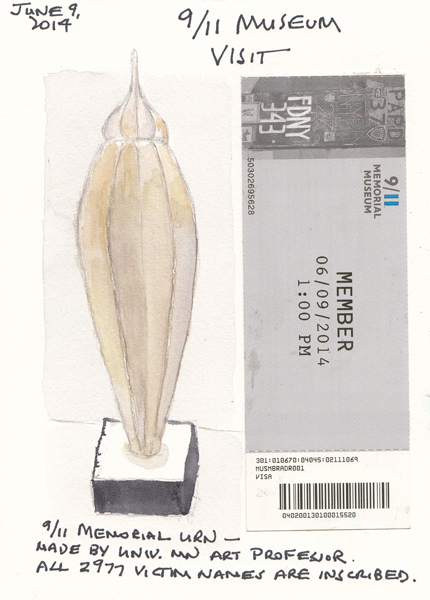 I am devoting this blog post to the recent opening of the 9/11 Memorial Museum - with only one small drawing that I did there on June 9th for my daily sketchbook. 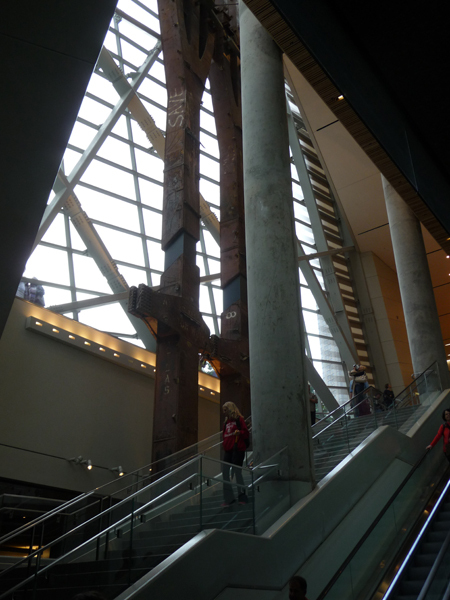 steel “tridents”— remnants of the North Tower’s façade — stand in the building’s atrium. 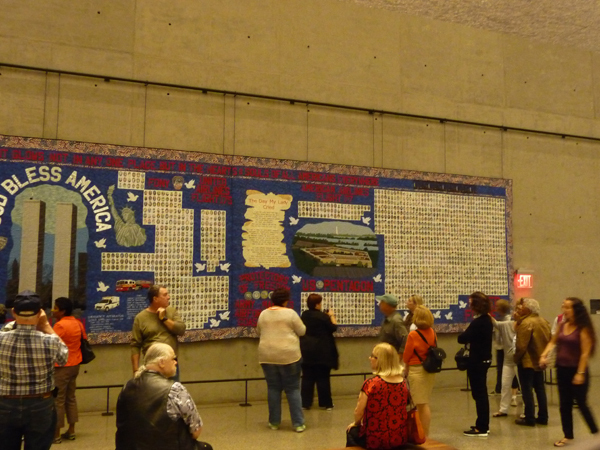 honors the individual victims of the attacks." 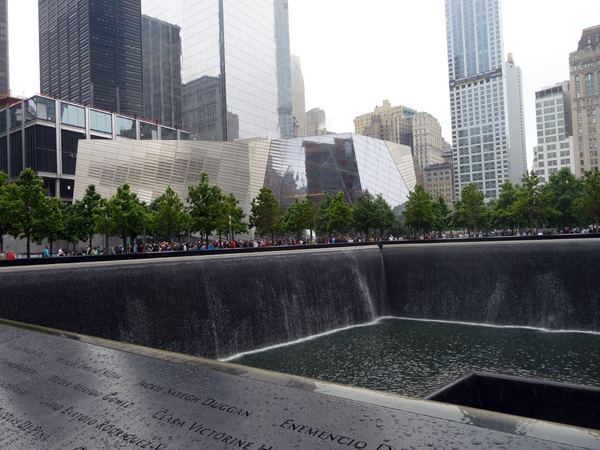 The museum is the low building behind the row of trees, between the Memorial pools that were created in the foot prints of the North and South Towers. 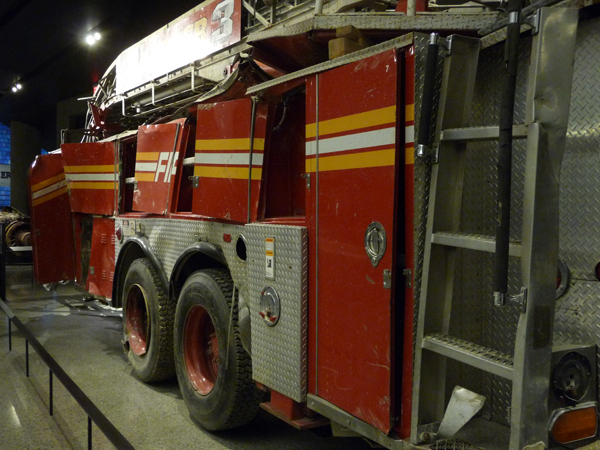 As soon as you enter the building you begin to descend stairs and ramps, past two of the original girders from the North Tower and adjacent to the Vesey St. stairway down which many of the survivors fled from the area. 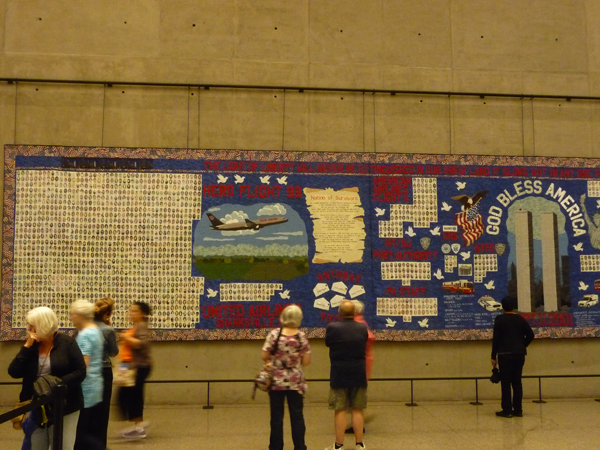 I loved seeing artwork that was created to commemorate the event and the victims, including a 60 foot quilt that contains photos of the victims from both Towers, the Pentagon, and the Flight that crashed in Shanksville PA.
Vehicles damaged on 9/11 make up some of the artifacts within the museum. 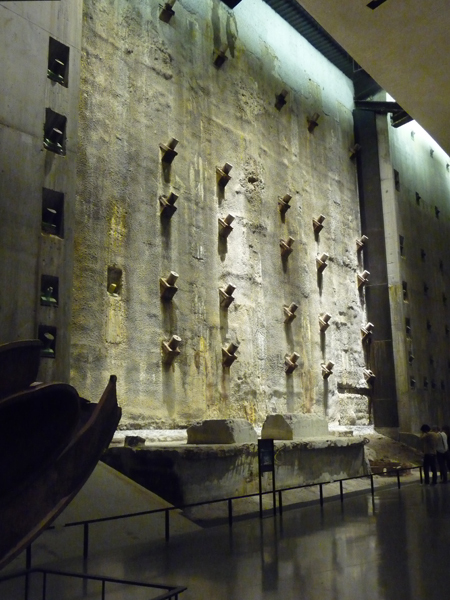 The bottom level, at the end of the ramps, has one wall which remains from the "bathtub" that was part of the foundation of the North Tower. 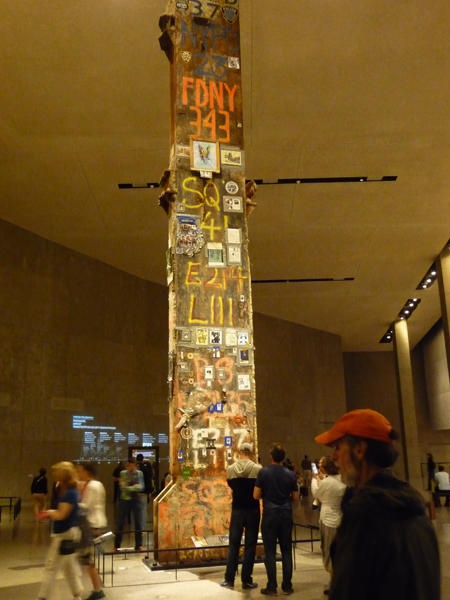 - and the main historical account of 9/11, the cleanup, and the building of the Memorial and Museum. The main exhibit is very well done will take several visits to look carefully at all of the photos, videos, and other displays. 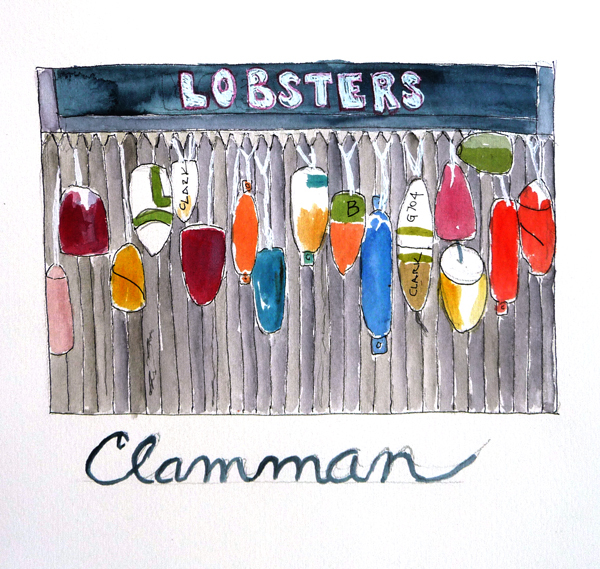 Our Meetup Sketching Group met here from 11AM-2PM last Saturday. The weather was gorgeous and it would be hard to find a more breathtaking urban scene. 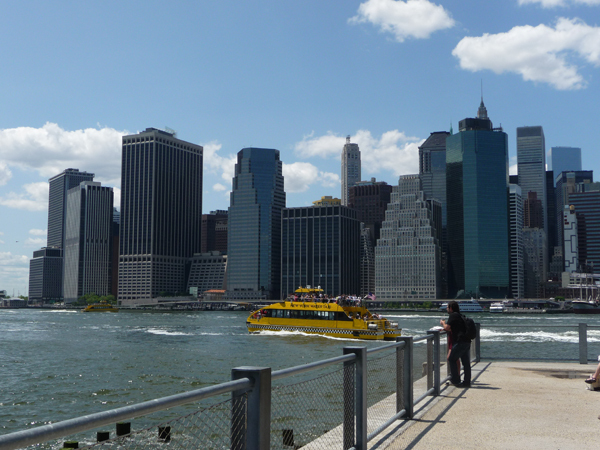 This is lower Manhattan - with the ferry terminals to the left and the new World Trade Center Tower to the right. We love our yellow taxis so much that even our water taxis are yellow. 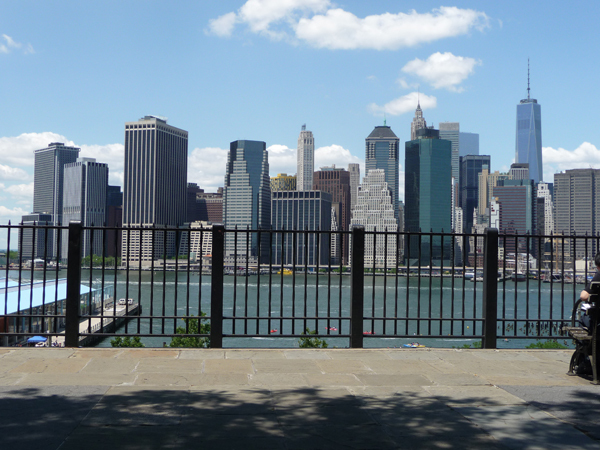 The Manhattan end of the Brooklyn Bridge - from the Promenade. I did this painting during our Meetup. I sketched and then met with the whole group to share our sketches. I then painted my sketch with watercolors and met again to share our sketches. 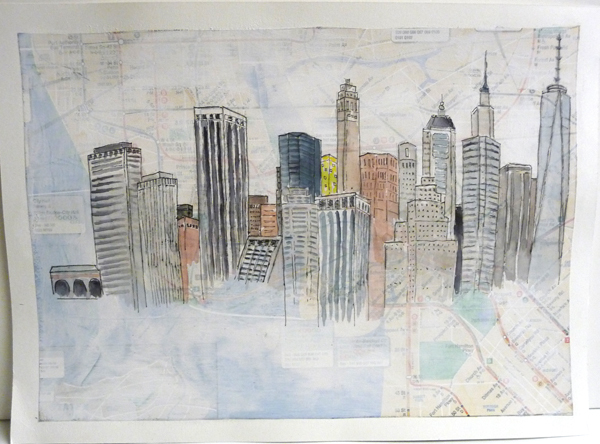 This is an 11 X 14" piece of watercolor paper to which I glued a piece of the New York City Subway Map. After the glue dried, I painted a thin layer of Golden Absorbent Ground over the map. It is a wonderful surface for graphite and watercolor. I have used this technique before for smaller pieces, and decided it would be perfect for the NYC skyline from the Brooklyn Heights Promenade. 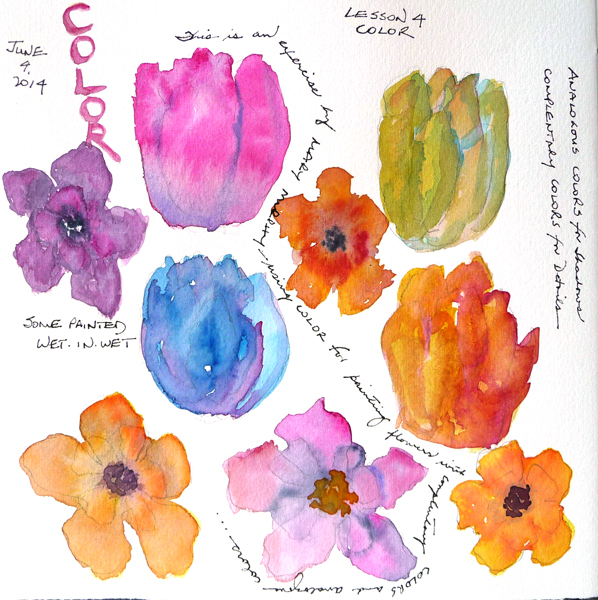 Making a Double Pamphlet Book is one of the easiest and fastest ways to construct a watercolor journal, a sketchbook or simple notebook. 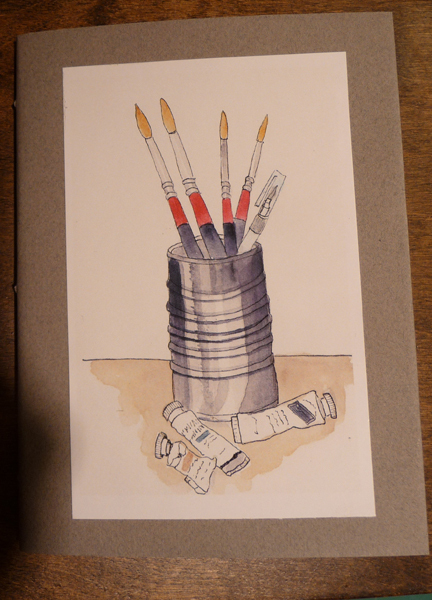 This is a watercolor sketchbook that I made in less than one hour and it has 24 pages of 140 lb watercolor paper which is perfect for a short trip or special project. The cover illustration is one of my watercolors that I scanned and printed out on matte presentation paper. You could paint, collage, stamp or stencil the cover based on the cover paper you choose. You can select any paper for the two signatures and cover. The only requirement is that you determine the paper grain and make the folds parallel to the grain. But I suspect that it is less of a requirement for this simple book than a hard-backed, cased-in, multiple signature book. The other supplies are relatively easy to collect - and there are many substitutes. Here is a photo of the supplies that I used. 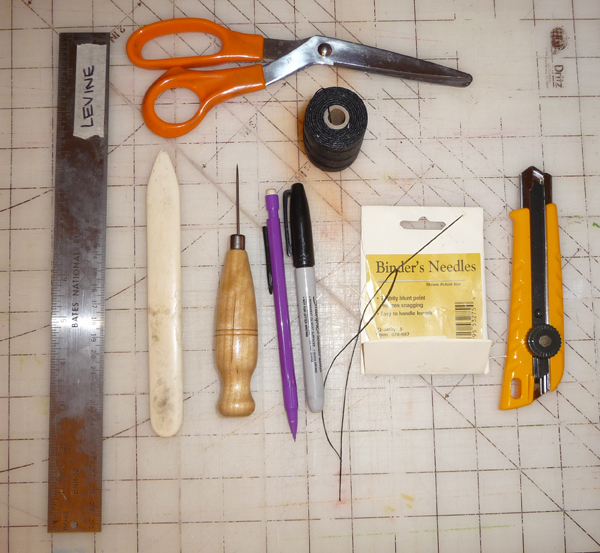 Ruler, Scissors, Bone Folder (or something else to press in the folds), Awl (or any sharp tool to punch holes), pencil, pen, Binder's Needles (or any other sharp heavy needle), Linen Bookbinding Thread (or carpet thread, dental floss, embroidery thread etc), X-acto Knife. Fold 2 signatures out of the paper you want for your journal. I used 140 lb paper and I tore 3 folios for each signature. With thinner paper you could increase the number of folios in each signature. See the definition of folios, signatures, and paper grain below. A folio is the full size page that gets folded in half to make up the signatures. Each folio will make 4 single-sided pages in the book. A signature is a collection of folios, all folded together. I use 140 lb watercolor paper and only two - three folios can be put in each signature. Grain is the orientation of the fibers in the paper - very much like fabric. Handmade papers don't have grain. 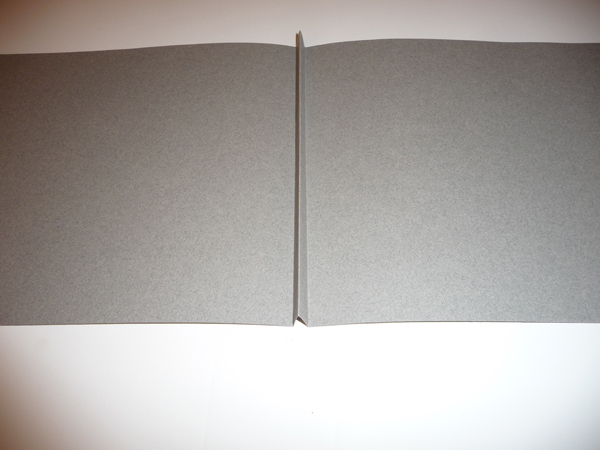 When making a book, the grain of the paper needs to be parallel to the spine of the book unless you want a wonky book. 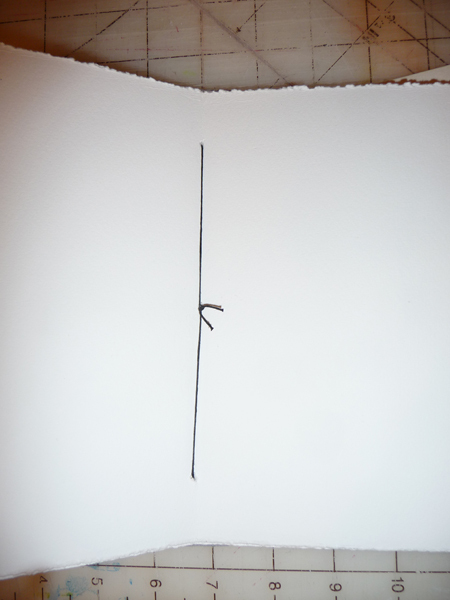 This is the first and last rule of bookbinding. My folio measured 7.5" X 11.25 ". The signature measured 7.5 X 5 3/4". 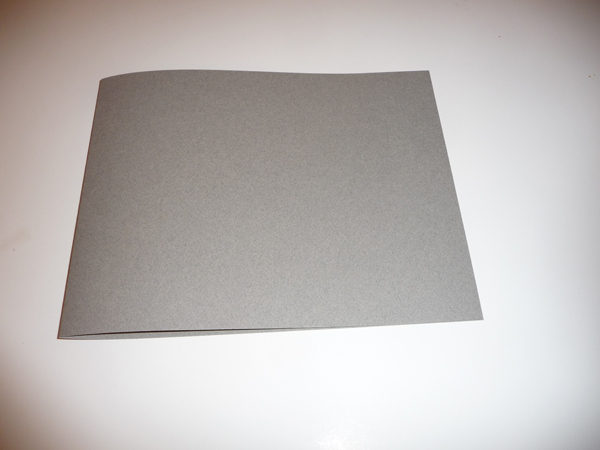 I used Canson Mi Tientes paper for the cover because it comes in many colors and is like card stock in thickness. It is easy to fold and punch for stitching. The paper grain is parallel to the short side of the sheet, so I wanted a paper that was wide enough to make the book (11.25 + 1" for the inside tab + 4-6" for cover flaps). This will become easier to understand as you read the next section. I used a metal ruler and X-acto knife to cut the cover across the longest width of the paper and then folded it in half. 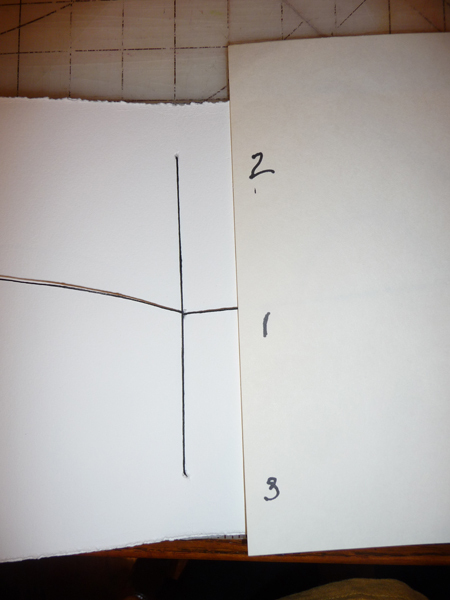 It is then necessary to score the paper 1/2" from each side of the fold and fold the front and back covers along that scoring line -in the opposite direction from the center fold. See the next few illustrations to understand why - it is the only confusing part of this book structure. You will create a tab in the center of your cover - and this will be the part of the cover you use to stitch the signatures to the cover in one simple pamphlet stitch. 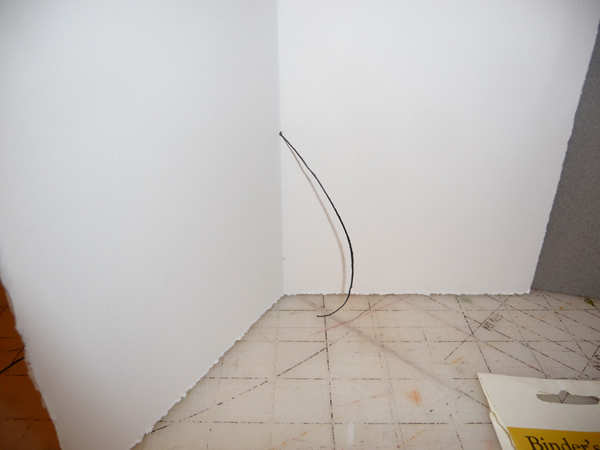 Getting Ready to Stitch Your Book Together: THIS IS THE SINGLE MOST IMPORTANT PHOTO!! Open each signature and line up the folds against the fold creating the tab. Note that one signature opens in one direction and the other signature opens in the opposite direction. You are now going to use a single pamphlet stitch through all 3 layers at the same time! 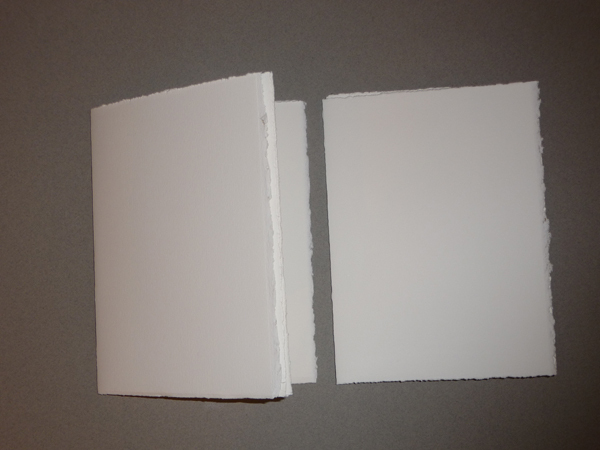 I cut my cover 1/8" more than the height of the folios to make sure that the cover protected the paper. Notice that the fold in each signature is lined up with the folds you created to make the tab. 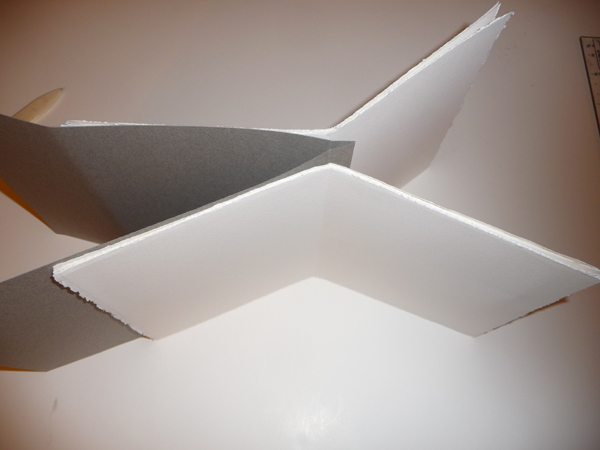 You will punch holes into the fold of each signature and in the folds that are 1/2" from the center fold in the cover. I made what bookbinders call a jig to punch my holes in both signatures and the cover. A jig is essentially a pattern that you can use to mark holes in the same positions on multiple signatures. Mine is a piece of paper that is about 3" wide and the height of the book cover. I marked the jig 1" from the top and bottom of the cover and in the middle - for a total of 3 holes. I then laid the fold of the jig in the fold of the signatures and the folds of the cover and punched holes with my awl. 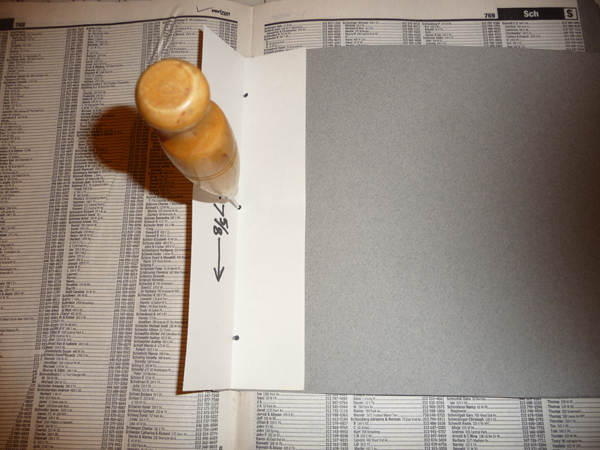 A phone book makes a wonderful support for the process because you can nestle the folds of your signatures and cover into the fold of the phone book. I punched the holes in each section separately because the papers were too thick to do them all together. In the next photo you see the cover being punched. 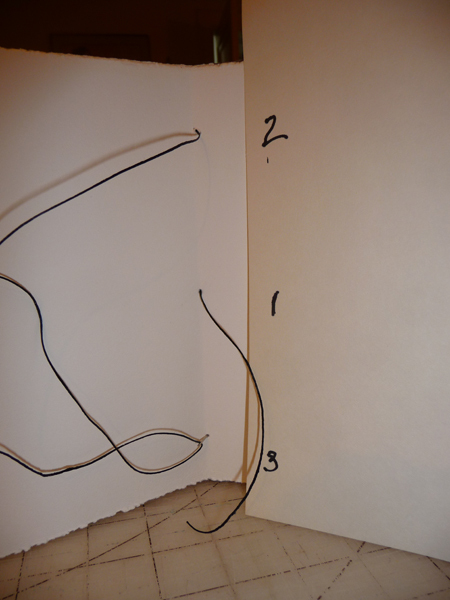 The tab is to the left, under the jig and the rest of the cover is to the right, and I'm punching the holes through two layers of the cover in the folds creating the tab. After the holes are punched, align both signatures, one on either each side of the cover tab as demonstrated in the earlier photo - and you are ready for stitching! The Pamphlet Stitch: There are many diagrams and video tutorials to learn a 3-hole pamphlet stitch. I've included a basic summary below. Cut a length of thread 3 times the height of the signature. Pass the needle out the center hole, leaving a 3-4" tail for tying later. Pass the needle back in through Hole #2 and out of Hole #3. Then pass the needle back in through Hole #1. It is important to have the two threads that are in hole 1 to straddle the long stitch between Holes #2 and 3 as in this photo below. Make sure the thread is pulled tight through all of the holes and tie a secure square knot ( I tie a square knot twice so it can't come undone). Then clip the ends to about 1/2". Creating Flaps: If you added several inches on each side of your cover, you can now fold them in over the signatures creating flaps. They can even be glued down across the bottom to create pockets. You can now decorate your cover with collage like I did, or paint, stamps, stencils, screens etc. HAPPY BOOKBINDING AND PLEASE CONTACT ME WITH ANY QUESTIONS. 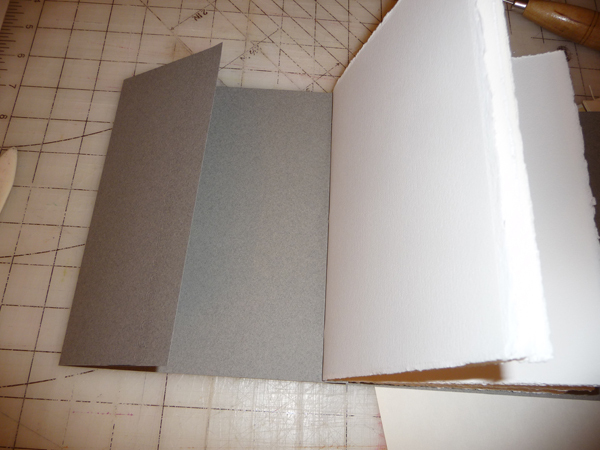 I'd also love it if you would leave me comments if you would like more bookbinding tutorials. 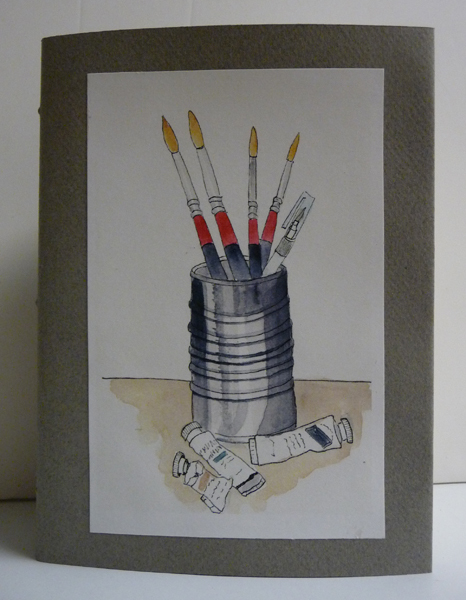 Here is a link to my tutorial for creating a watercolor journal from an old, orphan book. 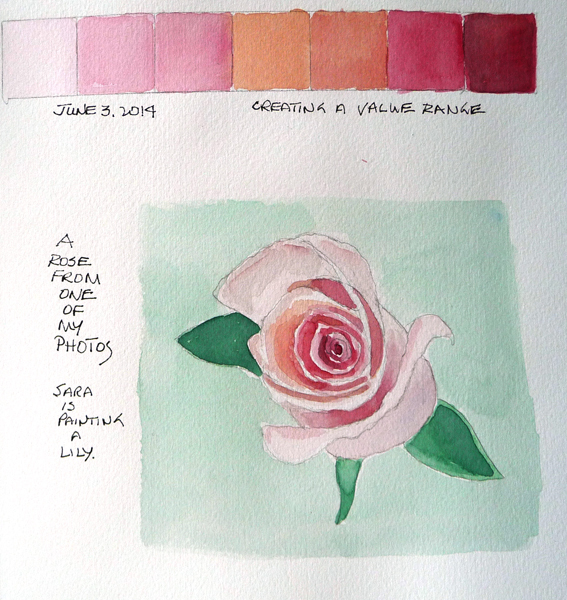 We are at the end of our beach vacation, and I have several more daily sketchbook pages and two exercises from a Craftsy Class I am taking with one of my friends while we relax in the house. 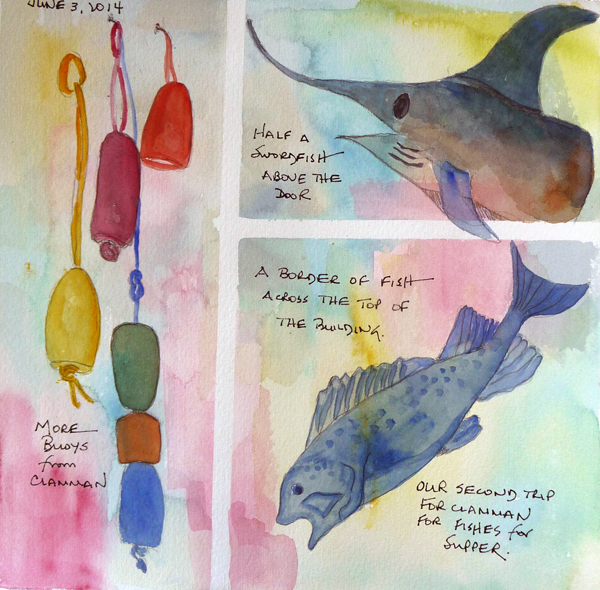 Some Drawings From Our Local Fish Store: More buoys, a swordfish sculpture above the door, and one fish from a series painted across the front, right under the roof edge. Morning Breakfast at the Beach Snack Shack: My friend Renee across the table. 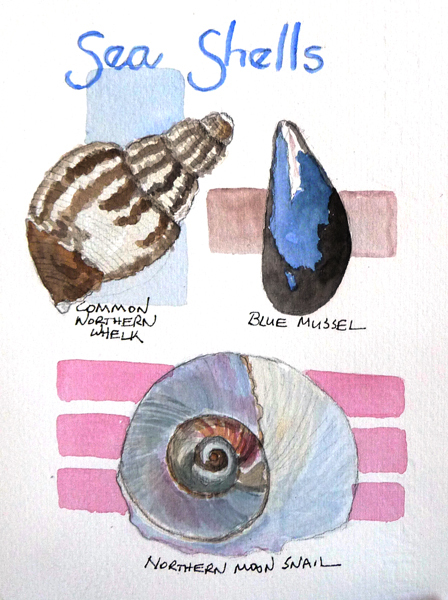 More Shells: A small oyster shell, a slightly chipped scallop shell, and my first (broken) Channeled Whelk Shell. I bought the Craftsy" Painting Watercolor Flowers" class with Mary Murphy so Sara and I could watch the lessons and paint together during afternoons. Here are two exercises - a value chart and rose in one and very wet-in-wet "fantasy" flowers in the other. I LOVE our early morning beach walks with two other couples. We walk one mile from our starting point and then turn around and walk one mile back. On weekdays we can have breakfast at the Snack Shack and sketch, paint, and talk. During our walks I constantly look for shells, and I'm surprised at the variation of shells and other things we find on the beach, which changes from year to year. Last year we learned about sand collars - mucus/sand 8" diameter flat structures made by moon snails and under which moon snails lay their eggs. This year moon snails of medium to large size are everywhere, but there are NO scallop shells. 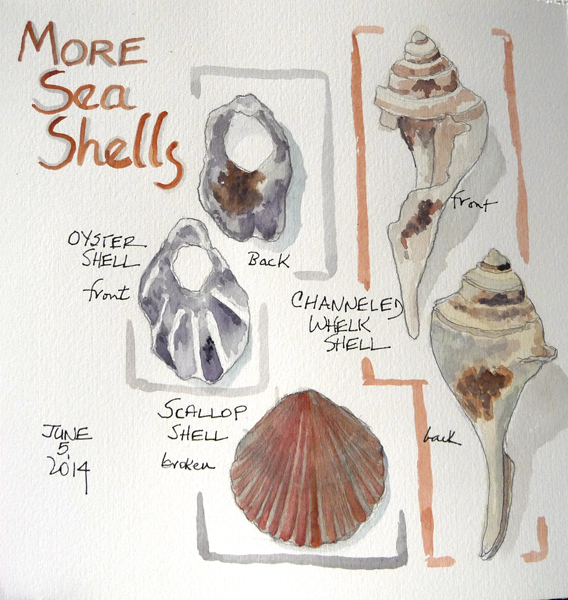 However, I found 3 whelk shells - two new varieties - which are definitely unusual.